An innovative X-ray method enables new high-pressure investigations of samples under deep mantle conditions. The technique, which was developed by a team led by Georg Spiekermann from DESY, the German Research Centre for Geosciences GFZ and the University of Potsdam, extends the range of instruments available to high-pressure researchers. Successful tests of the new method at DESY's X-ray light source PETRA III support the idea that heavy elements have to accumulate in magmas so that they could be stable at depths of Earth's lower mantle. The scientists present their work in the journal Physical Review X. The so-called standard conditions of chemistry, i.e. a temperature of 25 degrees Celsius and a pressure of 1013 millibar, are actually rare in nature. Most of the matter in the universe exists under completely different conditions. In Earth's interior, for example, pressure and temperature rise rapidly to many times the standard conditions. "However, even with the most elaborate deep drilling, only the uppermost part of the Earth's crust is accessible," Spiekermann emphasises. Researchers therefore simulate the conditions of Earth's interior in the laboratory in order to investigate the behaviour of matter under these conditions. Such experiments often involve determining the inner structure of the samples, which in many materials changes with increasing pressure. This inner structure can be explored with X-rays that are energetic enough to penetrate the sample and short enough in wavelength to resolve the tiny details of atomic distances. For this purpose, usually two X-ray based methods exist in high-pressure research: absorption and diffraction of X-rays through the sample. Based on X-ray emission, Spiekermann and his team have now developed a third method that can be used to determine both the bonding distances in compressed amorphous (disordered) matter and the so-called coordination number, which indicates how many direct neighbours an atom has. These parameters can be read from the energy and intensity of the radiation of a certain emission line of the sample, called Kβ" ("K-beta-doubleprime"). The Kβ" radiation is generated when the sample is excited with X-rays. The energy of the emission line depends on the coordination number, the intensity on the bonding distance. Experiments at the experimental station P01 at DESY's X-ray source PETRA III have confirmed the new method. "We have shown this, using the spectrum of germanium in compressed amorphous germanium dioxide, but this procedure can also be applied to other chemical systems," says Spiekermann. The method will provide scientists with an additional technique for investigating the structure of high-pressure samples. "The insight provided by a new measuring method is particularly welcome when different methods have so far produced significantly different results so far, as in the case of compressed amorphous germanium dioxide," explains DESY researcher Hans-Christian Wille, head of the measuring station P01 at which the experiments took place. For their experiments, the researchers exposed samples of germanium dioxide (GeO2) to a pressure of up to 100 gigapascals, about one million times as much as the atmospheric pressure at sea level. 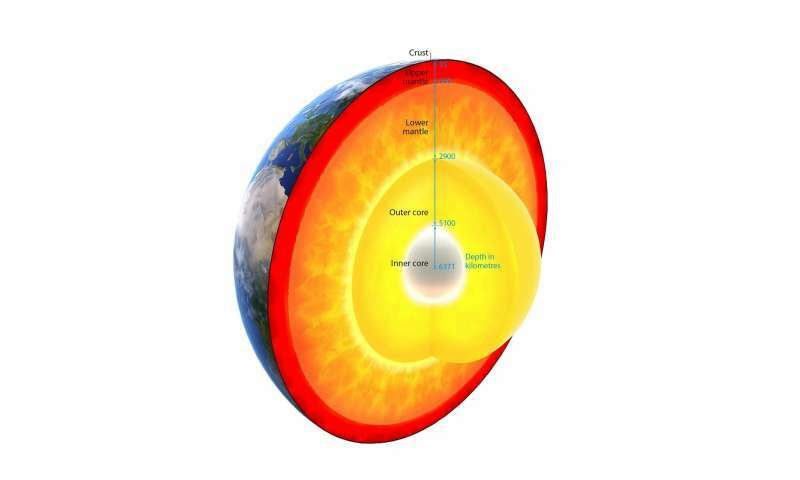 This pressure corresponds to a depth of 2200 kilometres in the lower mantle of Earth. The measurements show that the coordination number of germanium dioxide does not rise higher than six even under this extreme pressure. This means that even in the high-pressure phase, the germanium atoms each still have six neighbouring atoms as already at 15 gigapascals. This result is of great interest for the exploration of Earth's interior, because germanium dioxide has the same structure and behaves like silicon dioxide (SiO2), which is the main component of natural magmas in general. Since melts such as magma generally have a lower density than the solid form of the same material, it has long been a mystery why magmas at great depth do not rise towards the surface over geological periods. "There are two possible explanations for this, one chemical, the other structural," Spiekermann explains. "Either heavy elements such as iron accumulate in the melt, or there is a special compacting mechanism in melts that makes melts denser than crystalline forms of the same composition." The latter would be noticeable, among other things, by an increase in the coordination number under high pressure. 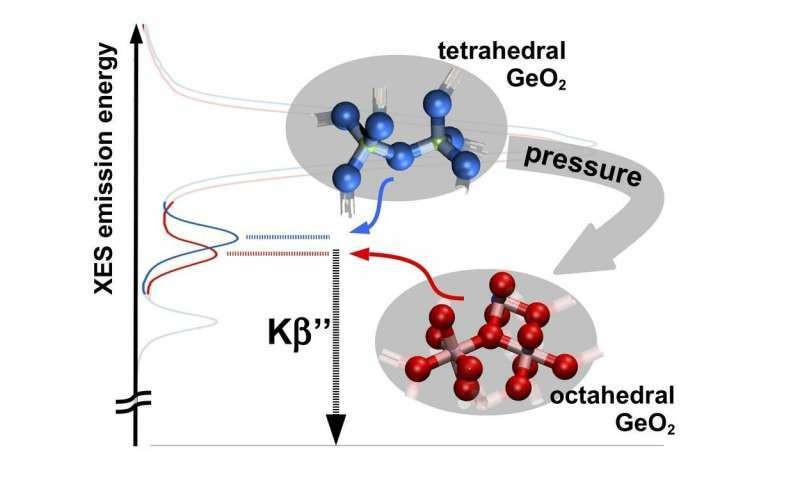 "Our investigations show that up to 100 gigapascals the coordination number in non-crystalline germanium dioxide is not higher than in the corresponding crystalline form," reports the researcher. Applied to silicon dioxide, this means that magma with a higher density can only be produced by enriching relatively heavy elements such as iron. The composition and structure of the lower mantle have far-reaching consequences for the global transport of heat and the propagation of Earth's magnetic field.